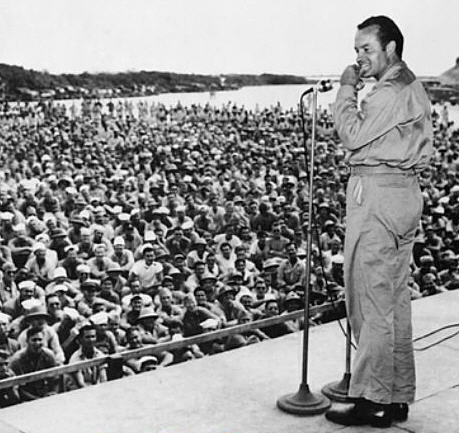 Does Bob Hope hold the record for headlining the most USO tours? Multiple sources indicate that Bob Hope headlined 57 USO tours, including Wikipedia and Legacy's article on Bob Hope's USO, among others. I believe this is the record. However, I have been unable to verify this. Is there any documentation indicating anyone else having completed more than 57 USO tours, or can a source be found which indicates Bob Hope's 57 tours is the record? The Daily Beast - which lists "nearly 200 USO performances” by Bob Hope, and I suspect this would also be a record, though I cannot confirm this either. P.S. Bob - Thanks for the memories! Browse other questions tagged world-war-two vietnam-war korean-war entertainment gulf-war or ask your own question. In WW2, which midget submarine program was the most successful? Was Casablanca a “safe” place for the Allies to hold a global conference in January, 1943? What does the phrase “Vietnam, the mixture of up and down” mean? How can I find the most complete list of the names of Kaytn Massacre victims? What were the most used drugs in battles and wars? Nazi Germany's secret service SD was first called Ic-Dienst, what does “Ic” stand for? Besides the USO, were there other organizations in New York City during WWll that provided entertainment for the troops? Does the ≈400,000 figure for US soldiers killed in WW2 include the ≈80,000 MIA?